These Chickpea Chocolate Chip Cookies are delicious, tender and light. Your kids will never even know they have chickpeas in them! I was feeling a bit sneaky when I made these chickpea chocolate chip cookies this past weekend. I usually like to involve my girls when I bake cookies, but this time I was planning on baking with beans and since I wanted my kids to try the cookies before telling me they didn’t like them, I had to bake them while they were away. Though I’ve seen many recipes that use beans in baked goods, this was my first time giving it a try. I have to say I had my reservations about the way they would turn out, but I was really pleased with the results. And best of all my kids really liked them. Though I did mash up the chickpeas quite a bit right at the beginning of making the cookies, I was surprised at how they disappeared in the cookies, not even a speck of a single chickpea! And the cookies don’t taste like they have chickpeas in them either. In fact, they taste really amazing, are tender, not overly sweet and feel as light as a cloud. I like my cookies still warm from the oven and found these especially delicious still warm. If ever you wanted to try baking with beans but had some reservations, I highly encourage you to try it, I think you will be pleasantly surprised by the outcome. Enjoy! These chickpea chocolate chip cookies are delicious, tender and light. Pre-heat oven to 350°F. Line two baking sheets with a silpat or parchment paper. In the bowl of your stand mixer fitted with the paddle attachment, add the chickpeas and start your mixer to break up the chickpeas, process for about 4 minutes, scraping the bowl down a few times to get the chickpeas properly mashed. You could also do this part in a food processor. Add the softened butter and beat with the chickpeas for about 2 minutes. Add the brown sugar and beat on medium speed until smooth. Add in the flour, ground oats, cornstarch, baking soda, cinnamon and salt, beat until just well blended, mix in the chocolate chips. Using a number 50 scoop (or a regular tablespoon), scoop the cookie dough and place the balls of dough on the baking sheet, 2 inches apart. Bake on the centre rack of your oven for 8-10 minutes, until cookies are just golden around the edges. Let the cookies cool on the baking sheet for a few minutes before moving them to a rack to cool completely. Store in an airtight container in the refrigerator, cookies can also be frozen. We buy so many tins of chickpeas but i have never thought of turning them into bickies – yum! Thanks! You should give these cookies a try, I think you’ll be pleased with how they turn out! My thoughts exactly! Thanks Nancy! I am aware of desserts made with beans but chickpeas?? This is the first time I am hearing about it! 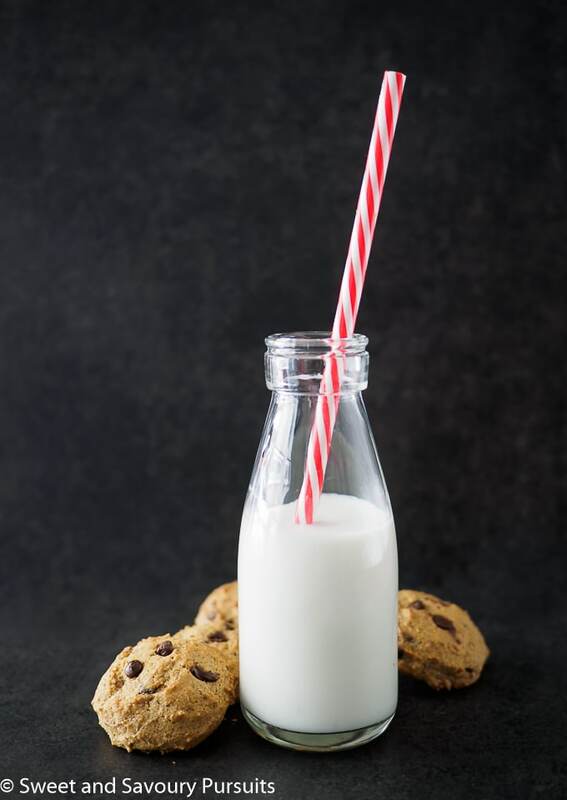 What a fantastic way to make the cookies a little more healthier for the kids! By the way, what exactly is pastry wheat flour? Thanks for bringing this to FF! Thank you! I like to use whole wheat pastry flour, instead of all purpose flour to increase the nutrition in my muffins and cookies. Whole wheat pastry flour is milled from soft white wheat, and regular whole wheat flour is milled from hard red wheat. Whole wheat pastry flour has a lower protein content than regular whole wheat flour so it’s great for making tender whole grain baked goods. What a wonderful idea! I’ve seen recipes using black beans but not chick peas. They do look light as a cloud. Thanks Julie, yes I’ve seen those recipes for brownies too, now that I know beans can be added to baked good and taste delicious, I think I may even try black beans in brownies! Thank you so much, trying hard to feed my kids some healthier treats! Chickpeas in the cookie dough?!! This is am awesome idea! Thanks a lot for sharing and for being at FF! Thank you Margherita! It’s a been a while since I’ve been to FF but it was always such a pleasure, nice to be there this week. Exactly, and it’s a great way to give children a little extra nutrition in their desserts! 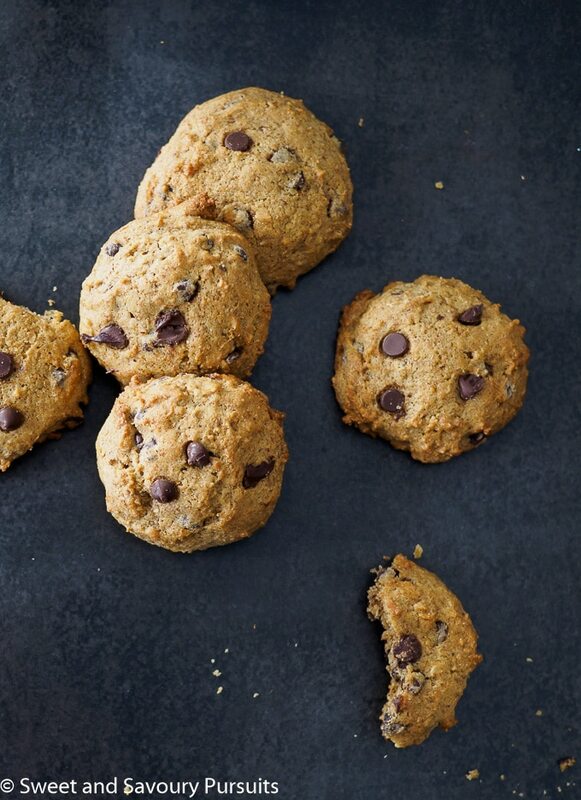 Great idea adding the chickpeas to the cookies. Love it, they looks amazing. Thanks Suzanne, they’re really delicious! Wow, amazing that you can put real chickpeas into a cookie and never know they’re there. These sound delicious, thanks Fida! Thanks Louise, I was pretty surprised as well, but not a single trace of chickpeas!